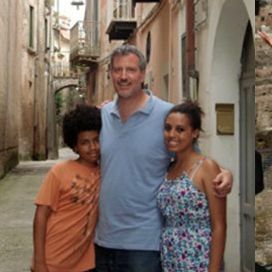 Lacking a Bermudan estate or Hamptons place to jet to on the weekends, Mayor Bill de Blasio and his family are doing what normal upper-middle-class people do and cramming all their summer travel into a single ten-day vacation. On July 18, the de Blasios leave for Italy, where they will tour Rome, Naples, Venice, and Capri. They’ll also make stops in Grassano and Sant’ Agata dei Goti, the respective hometowns of the mayor’s maternal grandmother and grandfather. So, he will have plenty of opportunities to eat pizza with a knife and fork. Over the course of the campaign, our family received lots of encouragement from Italy. Without pause, letters and emails of support flowed to us from across the waters. On election night, we watched in awe as the town of Sant’Agata live-streamed Bill’s victory in a small movie theater. We saw Italians—people who had never even met us—erupt in cheers when Bill won the final vote. The day after the election, we received photos of children, celebrating in piazzas in Sant’Agata, as well as in Grassano, where Bill’s maternal grandmother was raised. And on inauguration morning, we celebrated Bill’s swearing in surrounded by our friends and family members—many of whom had travelled all the way from Italy to enjoy that special moment with us. And while Chirlane has pointed out that this will be the first time the de Blasios have gotten out of town together since a 2012 jaunt to Niagara Falls, the Daily News and Times both noted that the trip will be “the longest vacation by any Big Apple mayor in recent memory.” Before anyone freaks out too much: first deputy mayor Anthony E. Shorris will babysit New York City while his boss is away, and the real mayor “will receive daily briefings from his top City Hall lieutenants,” according to the Times. De Blasio is also fully prepared to interrupt or postpone his vacation in the event of a local emergency, though, as Michael Bloomberg learned the hard way, it’ll be difficult for him to get back to the city fast enough to appease the press and public if disaster strikes. And, yes, the de Blasios are covering their own expenses, though the taxpayers will presumably foot the bill for the NYPD security detail that will accompany them, along with press secretary Phil Walzak and two other aides. (The Times reports that the staffers will “pay for their own accommodations on days when they are not conducting official business,” such as a possible meeting with the mayor of Rome.) Let’s just hope that they have some money left over for souvenirs, because this family was made for a group photo of everyone in matching caps and soccer scarves.